But, as we approach the second anniversary of the levy this April, we’re beginning to see what the new apprenticeship regime looks like. The number of starts – while still lower than the pre-levy system – has stopped falling, while the composition of those starts has shifted towards higher levels of study. First things first, the headline number. 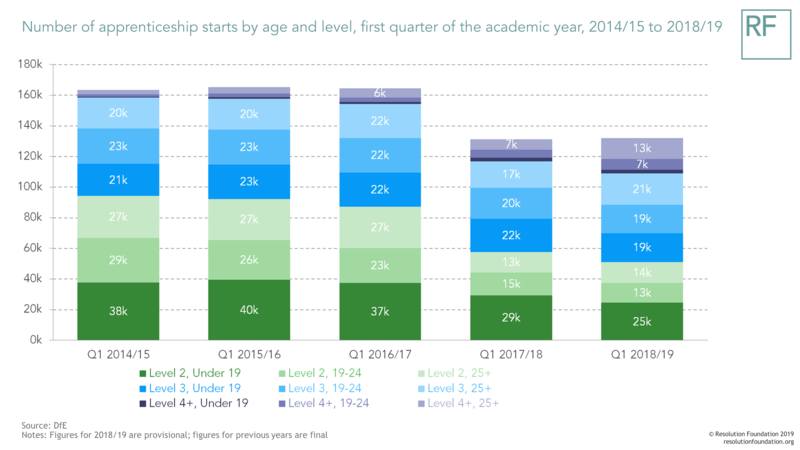 Comparing provisional figures for the first quarter of this academic year against final figures for the first quarter of last year, the number of starts is broadly equal. There were 700 more starts this year, an improvement of less than one per cent, though this could change when the final figures are published. So, while starts are still down on the pre-levy system, the volatility has subsided. What about the composition of starts? Are we moving to a model in which an ‘apprenticeship’ really refers to experienced staff enjoying MBA-level training? That’s certainly not the case yet. But today’s figures do indicate a growing share of starts at higher-levels of study. For instance, one-in-ten apprentices starting during Q1 of this academic year were over the age of 25 and on a higher education (HE) level programme – twice as high as this time last year. At the other end of the scale, the share of starts comprised by under 19s on Level 2 (GCSE-equivalent) programmes has fallen. In fact, the share of starts taken up by under 19s overall has fallen six percentage points. What’s more, younger apprentice starts tend to be frontloaded at the beginning of the academic year. The fact that we’ve seen falls in the share of young people starting a programme during the first quarter suggests that things could worsen as the year goes on. This could be a major problem if we want the apprenticeship system to provide young people with an alternative pathway into skilled work. 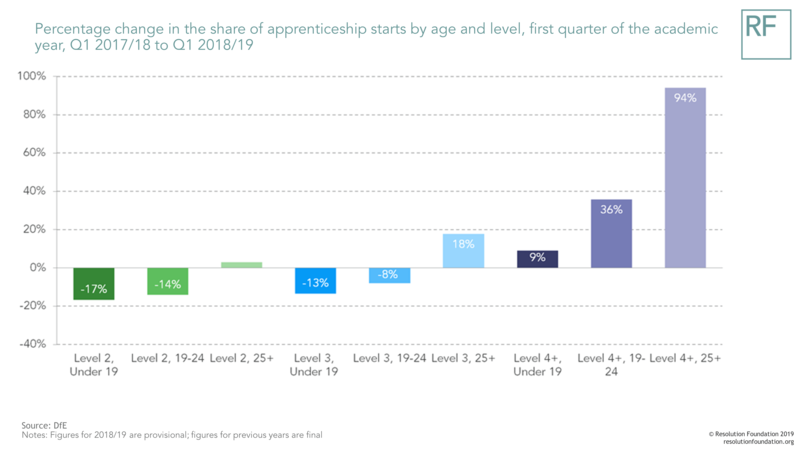 We get an even clearer sense of this when we look not at changes in the actual number (rather than proportion) of apprentices starting a programme in Q1 this year, compared to last. 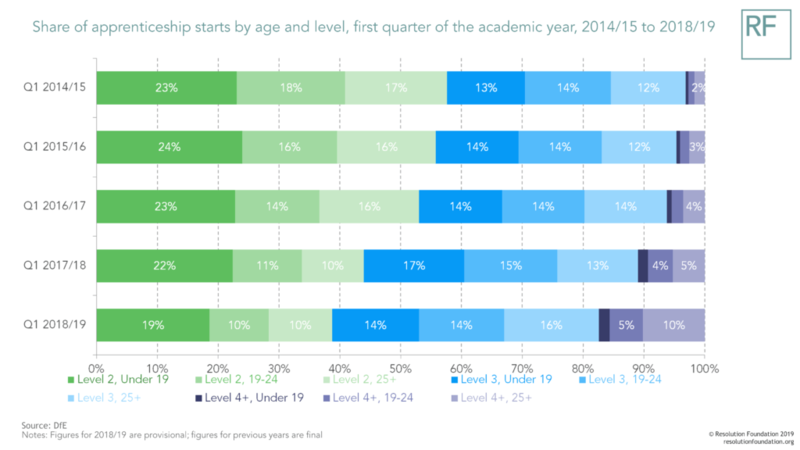 The number of starts at Level 4+ taken up by older apprentices has doubled, while the number of starts at Levels 2 and 3 for apprentices under 19 up to age 24 is down. So how does this all link up to the levy? The figures show that levy and non-levy paying firms are channelling resources into different types of programmes. As with this time last year, non-levy payers funded a slight majority (53 per cent) of starts. However, if last year is anything to go by we can expect levy-payers to overtake them later in the year. 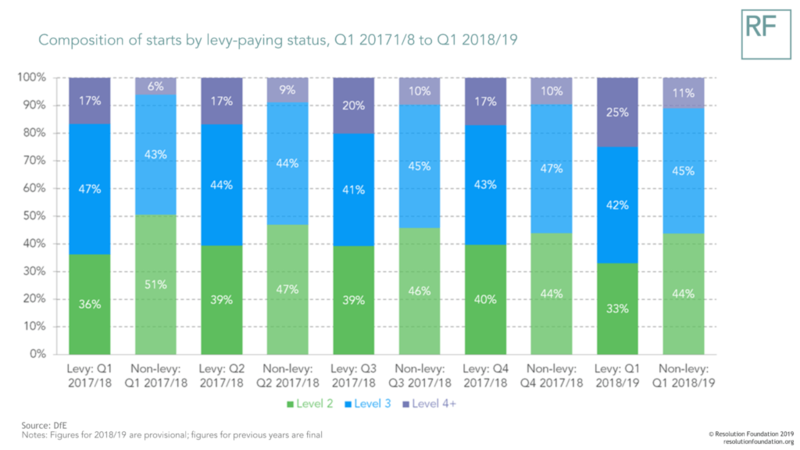 The type of starts that non-levy payers fund tend to look a bit more like the composition of the pre-levy system: a small but growing share at Level 4+, and a larger (but shrinking) share at Level 2. Over recent months, just over 10 per cent apprentices at non-levy paying firms were on an HE-level programme, over 40 per cent were either on a Level 2 or Level 3 programme. Levy-payers by contrast, have been funding a larger (and growing) share of Level 4+ courses – a quarter of people beginning a levy-funded apprenticeship over recent months were on an HE-level programme. The post-levy apprenticeship system is finally taking shape. The good news is that the sharp falls experienced at the onset of the levy have subsided. We may not be back to where we were, but the freefall has at least eased. The fact that the fall has been concentrated in lower-quality Level 2 programmes taken up by the over 25s is also positive. However, the fall in starts among under-19s is a concern. And while it’s good that employers appear to be investing more in training at higher levels of study, it’s crucial that this investment is not coming at the expense of opportunities to train young, non -university-bound, people into skilled, fulfilling careers. After all, it is this group that should be at the heart of reforms to apprenticeships, and wider technical education.